With all the hype since the beginning of 2019 around the #10yearchallenge, I gave an optional assignment to my students in the Data Science in Environmental Earth Systems Science (EESS) course (ES7023) at Nanyang Technological University, to conduct a #10YearsOfEarth challenge (learn more about the Asian School of the Environment at NTU). They compiled some wonderful visuals showcasing environmental challenges or successes in the past 10 years. The class itself is about data analysis and modelling in the field of earth and environmental systems sciences, but we also discuss data-visualisation. This assignment didn’t ask for any analysis, but the students demonstrated their skills in storytelling with data. The following are some of these posts! 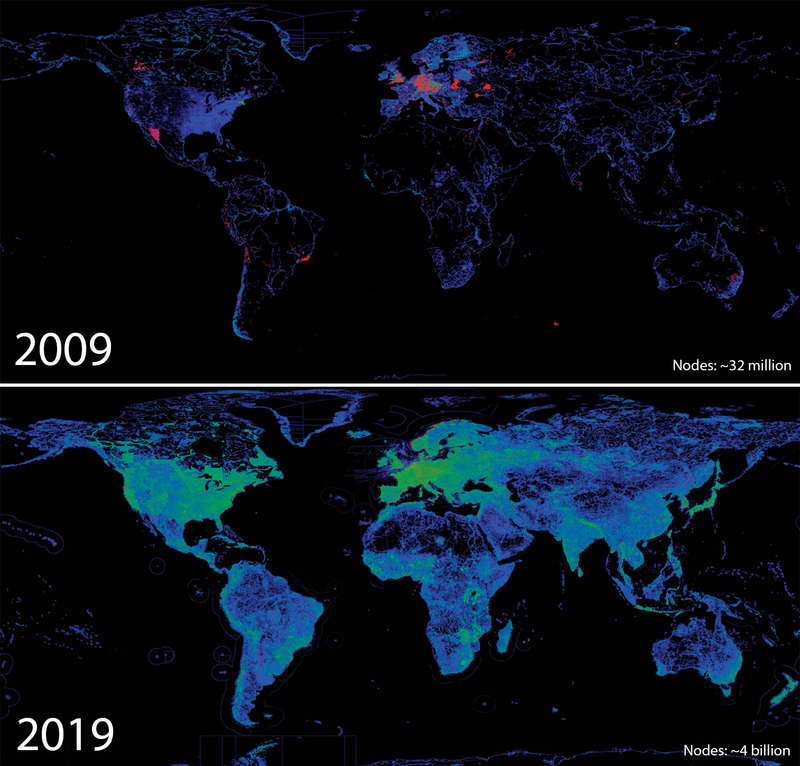 These are visualisations of the node density of OpenStreetMap (OSM) data of the world taken from 2009 to end of 2018. Brighter pixels represent areas with higher node counts (more building and road data). The increase of data demonstrated here is important because such free geospatial data can enable disaster responders to reach those in need. Through projects like #MissingMaps, the Humanitarian OpenStreetMap (HOT) global community creates maps of high vulnerability areas where data is scarce, putting millions of people onto the world map in OSM. These are two GoogleEarth images of Christchurch, New Zealand from March 2009 and September 2018. A number of suburbs along the Avon River were affected by the 2011 earthquake, especially by liquefaction. Over here, we can see that the suburbs of Avonside and Wainoni “the residential red zones”, which were once occupied by houses prior to 2011, are now grassy and devoid of many of the buildings that used to be there. I remember having my first Geology fieldtrip to Porrit Park which is the big park at the top right-hand corner, and looking at all the devastation that were left behind by the earthquake and sand boils everywhere. These series of images show what’s left of what used to be the 4th largest lake in the world, the Aral Sea – an example of how humans adversely impact the environment. These were taken from Moderate Resolution Imaging Spectroradiometer (MODIS) on NASA’s Terra satellite. The Aral Sea crisis caught my attention a few years back while reading an article in a Nat Geo magazine. Sadly, it seems the southern (larger) part is beyond recovery. In a last-ditch effort to save some of the lake, Kazakhstan built a dam to separate and isolate the northern part of the Aral Sea. It seems, however, that this crisis has reached the point of no return. Only time can tell whether this lake can go back to the way it was more than 50 years ago. You can also check out other environmental changes through time, such as coastline changes, global temperatures changes and changes on the Larsen-B ice shelf at NASA’s website. Image: M.Kudela, R., & J.Gobler, C. (2011). Harmful dinoflagellate blooms caused by Cochlodinium sp. : Global expansion and ecological strategies facilitating bloom formation. Harmful Algae, 71-86. The global phenomenon of harmful algal blooms, which is the core of my research here at ASE, has drastically increased in frequency and intensity over the past decades mainly due to the increasing utilization of coastal waters for aquaculture, increase in global temperatures, other anthropogenic activities that increase the nutrient load into the water systems and many other factors that encourages the unbalanced growth of algae bringing about a disruption in the ecosystem. In November 2007, Kelud volcano initiated a year-long unrest period typified by heightened seismicity, outgassing and rising lake temperature. Volcanologists noted the unusual unrest pattern, as Kelud tended to erupt explosively with little warning. Yet instead of erupting explosively, a lava dome 120m high extruded (top picture). 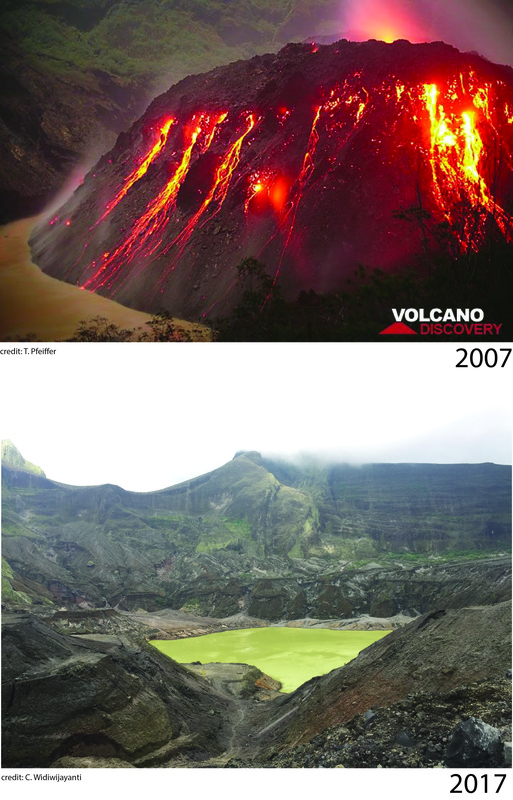 Since 2007, Kelud did erupt explosively in 2014. 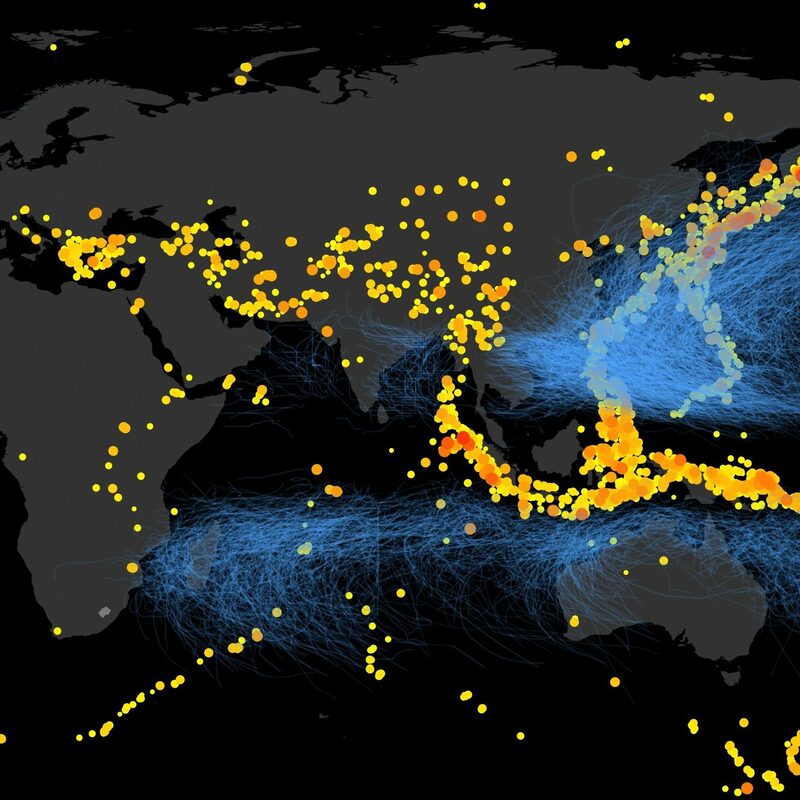 The VEI 4 eruption caused widespread damage and impacted the regional airspace. The chaos from the 2014 eruption contrasted with the quiescent volcanic activity observed in October 2017 (bottom picture) where the only activities of note are the lake bubbling and fumaroles passively degassing. 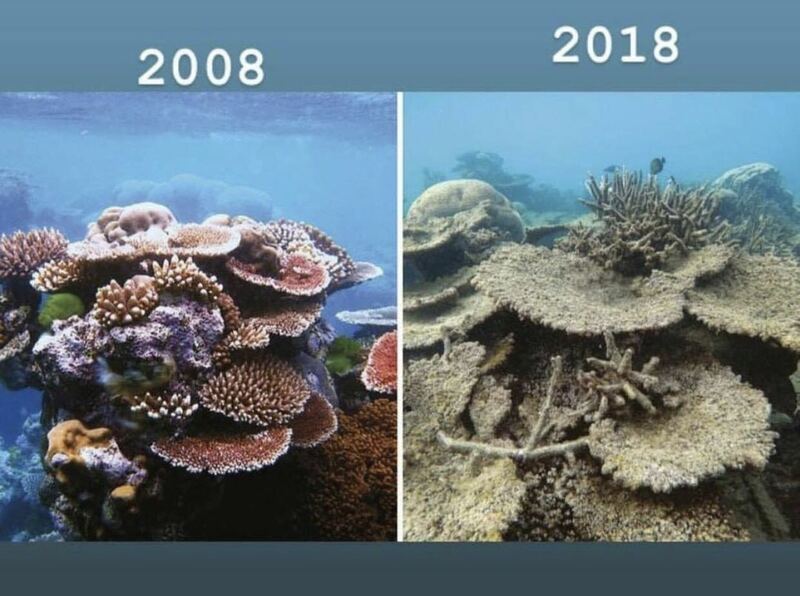 This is the #10yrsofearthchallenge we should be lamenting about :sob:, especially for those who enjoy diving! 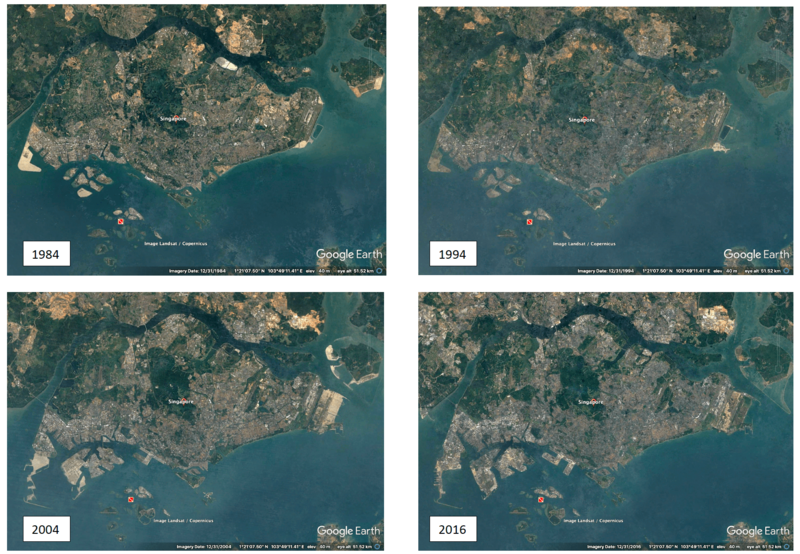 A bit late to the game but here’s an illustration of how Singapore’s coastline has changed over the years. Over 2 centuries, Singapore’s land area has seen a 25% increase from 578 to 719km2. While we enjoy the increase in land area, we must not forget how the biodiversity and ecosystem has been impacted due to human activities. With reference to the Tengah “forest town” issue, how should Singapore continue to develop without compromising the vulnerable ecosystems and wildlife that we have? Before/after comparison photos of Rhone glacier (Valais, Swiss Alps), the use of the slide tool to compare the panorama photos from past and today is cool: You can also select different dates. This post was written by David Lallemant and Lim Tian Ning.